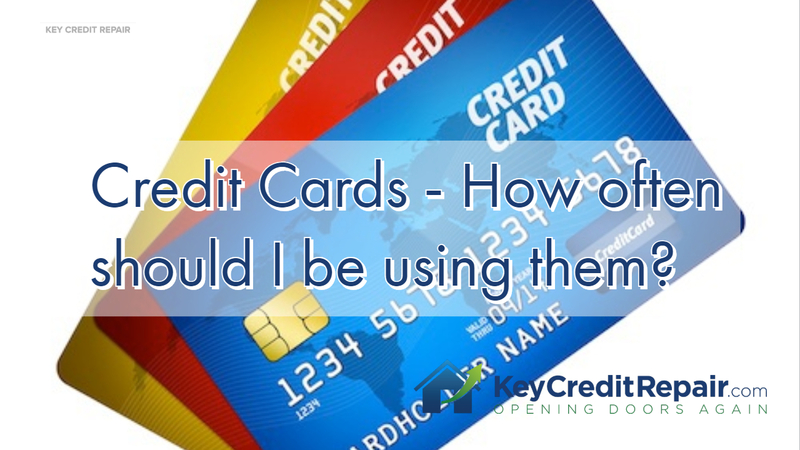 Credit Cards - How often should I be using them? Home / Credit Repair Blog / Credit Cards – How often should I be using them? Credit Cards – How often should I be using them? 00:00 YouTubers, what’s going on? This is Nik Tsoukales with Key Credit Repair. Excuse me, my voice is a little uh, beat, beat up here. Bear with me. A question of the day is, “Nik, how often should I be using my credit cards?” And, it’s a great question, and I think you’re going to be shocked at my response, and that response is never. I don’t think you need to. Um, I know you don’t need to, okay? One of the greatest little secrets of credit is the fact that if you don’t use your credit card, the bill comes in, it says zero due, and you don’t have to send a check, um, even though you’re not sending in a payment, it’s still reporting an on-time payment, guys. 00:34 And a lot of people don’t know this. Your banker’s not going to tell you this. The credit card companies are not going to tell you this, but this guy’s going to tell you this, because I’ve looked at, I don’t know, a hundred bazillion credit reports in my lifetime, okay? Let’s say you have a slew of four or five credit cards right now that are active, but you really don’t use them. I mean you can just don’t use them every single month, you are getting an on-time payment from that credit card, okay? 00:58 To fol-, uh, to follow up with that question, some people ask me, “Nik, but if I don’t use it, they’ll close it out.” That’s a good question. Okay. Um, if you’re scared of that, um, I, I haven’t seen it yet, I’ve not seen a card get closed, uh, because of no use. Uh, in my experience I have cards that are over 10 years old, I haven’t touched them, they’ve never been closed, okay? They’re expecting you at some point to make a purchase. But, if you’re worried about that, and you want to once every six months buy yourself a cup of coffee and pay it off the same day, if that makes you feel better, go ahead. Even that, I don’t think is necessary. 01:32 Also, some people will say, “Nik, but there’s an annual fee for that card. Should I pay the annual fee just to keep it open?” Heck yeah, you should. You know, if it’s a $29 annual fee, or $59 annual fee, or whatever it’s going to be, there’s a higher likelihood they won’t close out the card. Because they’re getting something, okay? It does have a little … The card does have um, some costs associated with it, they mail out a card every so often, they have to send you a statement, so if that alone covers their cost, there’s a higher likelihood that they would never close it out. So, I would absolutely pay the annual fee. I’m cool with it, okay? Because you know what you get. You know, you get a card, it’s active, it’s open, and it’s reporting on time, because you didn’t use it. 02:11 Keep the cash in your pocket, keep the cards at home. Throw them in the freezer. If you’re wondering what I mean by that, check out one of my previous episodes about, you know, how to freeze your credit cards, literally. Freeze them. 02:22 Guys, this is Nik Tsoukales, with Key Credit Repair. Thank you so much, have a great day.